Please enrol our school to receive the Primary Comprehensive Subscription (Preschool, Primary Picture Books, Nonfiction for Primary, Fiction for Primary, Primary School Popular Titles, Graphic Novels for Primary, Christmas and Primary International Subscription Upgrade). Please send an invoice for the price of $3815.00. Please enrol our school to receive the Primary School Basics Subscription (Preschool, Primary Picture Books, Fiction for Primary and Nonfiction for Primary). Please send an invoice for the price of $2,695.00. Please enrol our school to receive the Primary Picture Books + Fiction for Primary Subscription. Please send an invoice for the price of $1,705.00. Please enrol our school to receive the Primary Picture Books Subscription. Please send an invoice for $985.00. Please enrol our school to receive the Primary Picture Books Subscription with International Titles Upgrade. Please send an invoice for $1,355.00. Please enrol our school to receive the Fiction for Primary Subscription. Please send an invoice for $750.00. 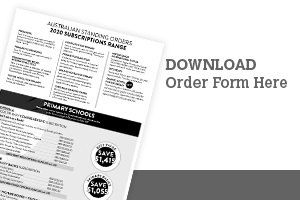 Please enrol our school to receive thePrimary School Popular Titles Subscription. Please send an invoice for $270.00. Please enrol our school to receive the Graphic Novel Subscription Please send an invoice for $$400.00. Please enrol our school to receive the Primary Nonfiction Subscription. Please send an invoice for $640.00. Please enrol our school to receive the Preschool Subscription. Please send an invoice for $395.00. Please enrol our school to receive the Primary Christmas Selection. Please send an invoice for $130.00.